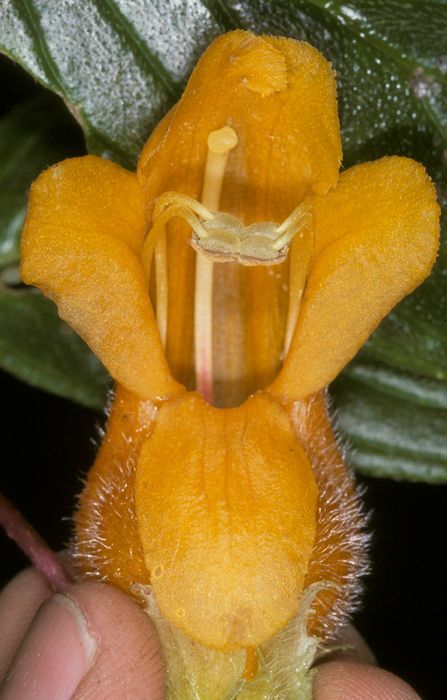 This flower of C. strigosa nicely illustates the stamens fused in pairs and the bilaterally symmetrical form of the flower — if cut down the middle, the two halves would be mirror images of each other. The top two of five corolla lobes are fused together to from the “galea” or hood and this becomes one of the two lips referred to in “bilabiate”. The other lip is the bottom lobe. 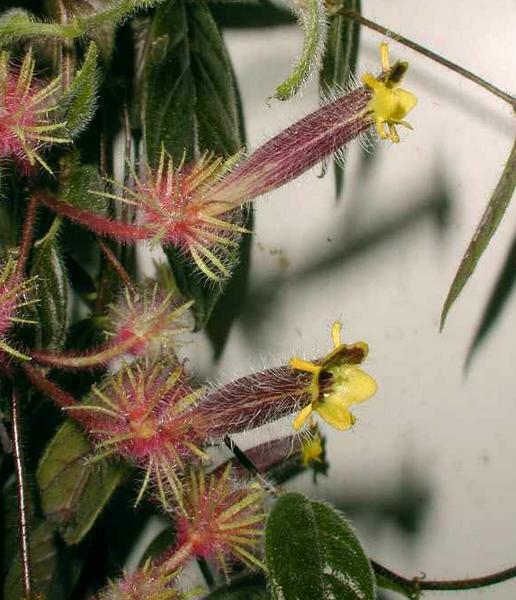 Flowers in Columnea appear in the axils of the leaves and generally occur singly, but can occur in clusters of up to 10 flowers per leaf axil. In most species only a single, or perhaps two flowers will be fully open at each node at any one time. 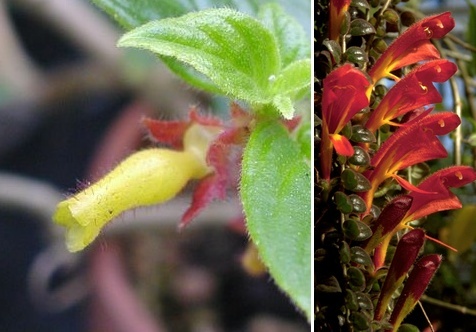 All Columnea flowers have the four whorls associated with flowering plants. These are the calyx, made of sepals; the corolla, made of petals; the androecium, made of stamens that produce pollen and the gynoecium, where the pollen lands and grows downward through the style to fertilize the egg in the ovary. In Columnea the five sepals are fused to each other at least to some degree, but often are free from each other at the tips. The same is true for the five petals. There are four fertile stamens in each flower and these are often coherent in pairs of two stamens each. Coherence indicates that the stamens stick to each other, usually at the tips of the anthers where the pollen is produced. The bases of the stamens are fused to the corolla, as they are in all Gesneriaceae and if you pull the corolla off the flower, the stamens will come with it. After the pollen is shed, the filaments will coil up and pull the anthers into the corolla tube. The gynoecium consists of two fused carpels that for non-botanists will look like a single structure with an ovary, style and stigma where the pollen lands. Note the yellow appendages protruding from between the corolla lobes in C. minor. 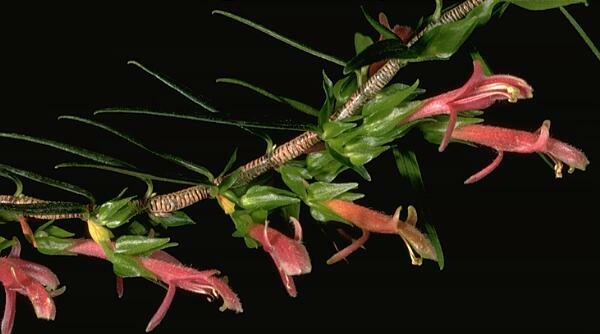 One of the oddities of Columnea flowers are corolla appendages that appear between the corolla lobes in many species of section Trichantha, such as C. minor. These appendages have been used to readily recognize species in this section and can be small to larger than the corolla lobes themselves. It is presumed that they have a role in pollination, but to date we have no solid or clear explanation for these structures. Despite the technical fruit character that separates Columnea from its closest relatives, most species can still be recognized by a combination of vegetative and floral characters. The epiphytic nature of Columnea in its natural habitat is certainly not exclusive to this genus, but is most often shared with species of Drymonia that typically have a bilaterally symmetrical calyx, whereas species of Columnea always have a radially symmetrical calyx. The corolla of Columnea is always tubular although this can vary widely and be strongly pouched like some species of Nematanthus, have a very narrow limb (the part of the corolla that is not the tube) that is relatively inconspicuous, or a limb that is large and flaring. The corolla tube also varies widely in its size, in both diameter and length. The smallest of these is in Columnea minutiflora which has a corolla that is often less than a cm in length, only a few mm in diameter and is white. In contrast the large, bright red corollas of Columnea nicaraguensis with its large flaring limb do indeed seem to belong to a different genus. Corolla colors are typically yellow or red but can be orange, violet, white, pink or combinations of these. Many species often have a bright red corolla tube and a limb that is a contrasting pale green. C. linearis has passed on its pink flowers and spreading habit to many hybrids. The corollas of Columnea species are considered to be bilaterally symmetrical, meaning there is one line that will divide the corolla into two parts rather than being radially symmetrical, where there are numerous different ways of dividing the corolla into two equal parts (humans are bilaterally symmetrical whereas car tires are radially symmetrical). Sometimes this is obvious when we have flowers that have a galea or hood comprised of the fusion of the two center petals. These are often flanked by two other petals with the fifth petal at the “bottom” of the flower, often curved backward. An example of this is C. gloriosa. However even when the corolla lobes are small and inconspicuous, the corolla still has a bilateral symmetry based on the orientation of the corolla lobes, such as C. ambigua. C. ambigua has very small corolla lobes. C. gloriosa has its top two flower lobes fused into a galea or hood, and a lower lobe reflexed downward. Both are bilaterally symmetrical.